The Minnesota Wild finished the 2015-2016 season with a 38-33-11 record, good for fifth in the tough Central Division and nine points behind the Nashville Predators. They scored 216 goals and allowed a miserly 206 goals against, which immediately sheds light on the sort of hockey the Wild have been playing. For better or worse, the game plan is changing. Minnesota will commence 2016-2017 with head coach Bruce Boudreau behind the bench. The Wild hired Boudreau eight days after he was fired from the Anaheim Ducks, with designs on transforming the club into an up-tempo, offensively-minded squad. Eric Staal was signed to a three-year deal in order to assist in that goal. Minnesota is in an interesting state right now, with a decent mix of veteran and young talent. Boudreau will get the most out of players like Jason Pominville and will drive fresher skaters like Mikael Granlund and Jason Zucker to higher levels of production. And defenceman Ryan Suter continues to be the linchpin, quietly amassing good numbers and driving the play from his own end. 32-year-old local Zach Parise had 53 points in 70 points, including seven goals on the power play. He averaged 19:17 of ice time a game, had 234 shots on goal and managed seven game-winners. While he’s never the biggest player on the ice, Parise has the hustle and drive to push possession numbers and can slip around most defenders with ease. He’s also one of the smartest players in the game. 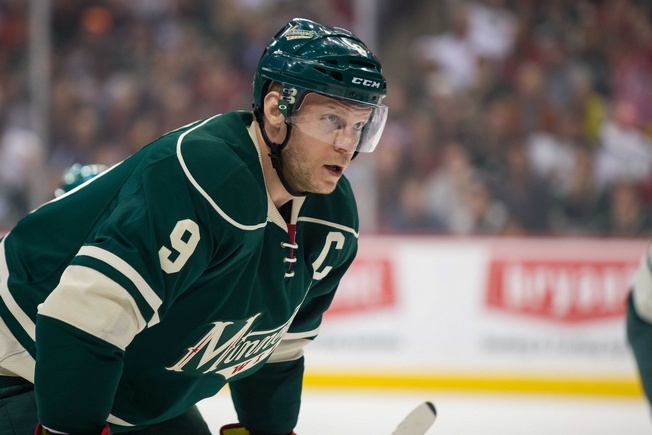 Centre Mikko Koivu had 56 points in 82 games last season and is the leader of this franchise. He is a terrific skater and a very resolute player, which sets him up for multiple opportunities a game. While Koivu is prone to scoring slumps, he’s been pushing a well-rounded brand of hockey and seems to be improving his physical game. Winger Charlie Coyle was good for 42 points last season, including two goals on the power play. The 24-year-old averaged 17:18 a game and is one of the Wild’s most offensively-minded skaters. He is an instinctual player with great hands and can play both as a setup man and as a goal-scorer. Under Boudreau, Coyle should thrive. Staal may have seen better days, but he’s still capable and can play a complete game. The 31-year-old could even be in line for a resurgence of sorts. He averaged 18:33 of ice time a game last season, put up 39 points and cracked off nearly 200 shots on target. He’s one of the most aware players in the game and brings a long reach, which can help when it comes to protecting the biscuit. 31-year-old Suter had 51 points in 82 games and averaged 28:35 a game, which sheds a lot of light on how important the Madison native is to this hockey club. He is one of the best all-around defencemen in the sport and can put up points on the power play, which makes him a valuable buy at any level. Suter owns a heavy point shot and thrives when he plays more minutes, so he should be in line for another good year in Minnesota. Edmonton’s Jared Spurgeon had 29 points in 77 games last season. He averaged 22:40 of ice time a game and scored five goals on the power play. He’s a confident player and excels when it comes to moving the puck out of the defensive zone. Spurgeon is also a strong positional player, even if he’s a little undersized. Boudreau will rely on him for big minutes. Marco Scandella is a solid option for Minnesota. He had 21 points last season and plays a shutdown brand of hockey. He averaged 20:42 of ice time a game in the regular season and should be in line for more minutes in 2016-2017. He doesn’t seem to be a natural on the man-advantage and can get caught flat-footed against quick forwards, but there’s a lot to like about his overall commitment. Devan Dubnyk went 32-26-6 last season, with 2.33 goals against average and a .918 save percentage. He posted five shutouts. The 30-year-old from Regina is huge at 6’6, 212 pounds. He covers a lot of the net and can dominate if he can maintain position. He’s not the most mobile goalie in the league and benefits from the Wild system, which could be put to the test with a new coach. Saskatoon’s Darcy Kuemper was 6-7-5 last season, with a 2.43 goals against average and a .915 save percentage. He can handle the puck well and is gifted with superior lateral movement, which allows him to make quick saves. Kuemper doesn’t challenge many shooters, however, and well-studied opponents find twine by heading blocker side. Minnesota’s prospect pool was once the stuff of legend, with players like Coyle and Mikael Granlund making the big leagues with considerable results. The issue now is a lack of picks, with the Wild only managing four selections at the 2016 NHL Entry Draft. There are some tantalizing prospects, like winger Alex Tuch of Boston College. The 20-year-old should be set to go in Iowa this season and could make the jump to Minnesota in short order. Joel Eriksson Ek not only has a name for the ages, he has a terrific shot as well. The 19-year-old Swede made a big impact at development camp this summer and was named his country’s best player during the USA Hockey National Junior Evaluation Camp in Michigan, where he was the team captain and managed three points in four games. The 2016-2017 season should be an interesting one in Minnesota, with the Wild primed to take a step in a different direction. Boudreau will revamp the style of this hockey club and a period of adjustment will be required to buy in, but the Wild have all the required parts to make a run. This is a speedy, possession-hungry team and that suggests the state of hockey will be just fine.